Disney on Thursday announced its much-anticipated streaming platform Disney+, and Chairman and CEO Bob Iger claimed its company's brand name gives it an edge over rival streaming service Netflix. However, some analysts covering the streaming space are doubtful of Disney+'s ability to disrupt Netflix's dominant position. "We do not view Disney+ as a strong alternative to Netflix," says SunTrust tech analyst Matthew Thornton. "Bottom-line, Disney+ features family content, while Netflix offers a much broader range of content with the majority of the most-searched content on the platform." "We still do not view it as a major threat to Netflix subscriber numbers given Netflix's quality & quantity of content, along with the global secular shift toward streaming," says J.P. Morgan analyst Doug Anmuth. The media giant on Thursday announced its much-anticipated streaming platform Disney+, which will be rolled out on Nov. 12. Disney Chairman and CEO Bob Iger claimed its company's brand name gives it an edge over rival streaming service Netflix, which he said is "still" building its brand. 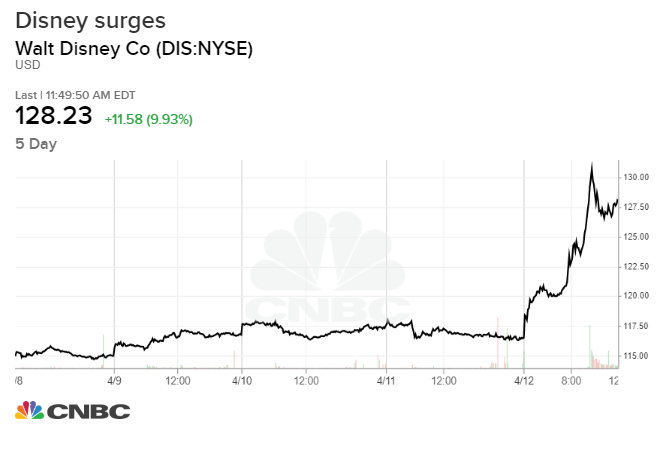 Disney's stock surged as high as 12% on Friday, on pace for its best day since May 2009. Netflix shares fell Friday. However, some analysts covering the streaming space are doubtful of Disney+'s ability to disrupt Netflix's dominant position, saying its family focused content offering lacks quality and quantity compared with Netflix's. "We do not view Disney+ as a strong alternative to Netflix," Suntrust tech analyst Matthew Thornton said in a note Friday. "Bottom-line, Disney+ features family content, while Netflix offers a much broader range of content with the majority of the most-searched content on the platform." J.P. Morgan analyst Doug Anmuth also said Disney+ doesn't pose a threat to Netflix. "While we expect Disney+ will likely be the most competitive streaming offering to Netflix, we still do not view it as a major threat to Netflix subscriber numbers given Netflix's quality & quantity of content, along with the global secular shift toward streaming," Anmuth said in a note to clients Friday.